What's going on at CC HQ at 2pm a couple days a week? WE are working on keeping great systems for you! We meet to keep our skills high and are service great! We discuss how to make our program better, give you more, and keep elevating our game! Let us know what we can do for you. If you have any suggestions, comments, or complaints, let us know. We want improve and unless you let us know how we are doing, the good and the bad, we won't know! Feel free to leave your comments here as well as an email to myself or CC HQ! Get your kids to eat RIGHT! Next generation is our job. We can do whatever we want and we are the influence of the next generation. How's it looking for us? My kids eat like I eat. Why? Because I SAID SO! 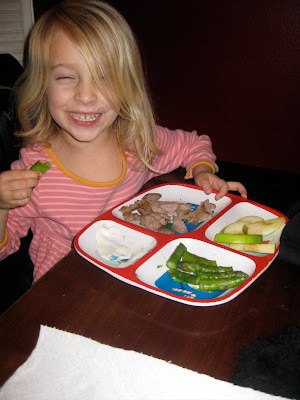 How do your kids eat? Like you? Why or why not? Savannah is dipping her asparagus in organic ranch... is that bad? NO. she is also eating apple and fresh farmers market pork. YUM! You and I are governed. The weather determines what we wear. The terrain tells us how to travel . . .
God—our Shepherd—doesn’t check the weather; He makes it. He doesn’t defy gravity; He created it. God is what He is. What He has always been. God is Yahweh—an unchanging God, an uncaused God, and an ungoverned God. Lent is upon us. Take this time to reflect. Breathe. Heal. Become. I just want to put out a few more details about the Women's Master Mind Fight Club to clarify what will be involved in participating and to answer some of the questions I've gotten. The time commitment will be roughly 3-5 hrs/week including meetings, workouts, assignments, and reading. The kick-off will be Tuesday, March 2nd from 7:00-8:30pm. Out-of-towners will get a kick-off email that night. The retreat will begin at 8:00am on Saturday, May 1st. We will meet at CrossFit Central and carpool to a ranch in Bertram, TX, returning to Austin at 12:00pm on Sunday, May 2nd. The sign-up process is this: please send me a brief essay (1 page or less!) explaining why you want to do this program. If you would like to be considered for a scholarship please mention that in your essay. I am holding spots for those who have already commented on the blog or contacted me to express their commitment. So far I have 9 women in Austin and 3 women from out of town. That leaves 3 open spots (1 for an Austinite, 2 for out-of-towners), which will be filled on a first come basis so act fast if you want in! Please wait to pay until you hear from me confirming that you have gotten one of the 15 spots. You can pay via check or cash at the kick-off meeting or you can pay with a credit card via PayPal to carey.kepler@gmail.com. Out-of-towners can mail checks to me at CrossFit Central's address--please make your check out to "Carey Kepler" and put "MMFC" in the memo field. You can either pay in full to receive the discount, or if you are paying monthly, payment will be due by the 1st of each month for that month. You will receive additional details, including the plan for each week from March-November, when we kick-off. Any more questions? Please leave them in the comments! The Woman's Master Mind Fight Club will start March 2, 2010. Ladies (sorry guys you can't get in on this one), we are a go! Some of you have been waiting, some of you thought it would not happen, some of you forgot, well, all of you now get to decide if it is for you and if it is "your time" to do the Master Mind Fight of your life, for your life. I Can, I Will, I HAVE to. I will fight. I will choose to seek Wisdom. I will take responsibility to persist with out exception. I will decide with all my heart to be a person of ACTION. the life I know that is in MY soul. Ladies here are the details. I know there are going to be lots of questions so please ask in the comments so we can hash them out as fast as possible! * 9 months of weekly work designed to help you establish and reach your goals. Weekly work will be a mix of assignments, reading, workouts, and meetings. Expect to commit 3-5 hrs per week. * One weekend retreat on a ranch outside Austin, TX. The retreat will run from Saturday morning until Sunday afternoon. Delicious, healthy food will be provided. * Strong, determined women who are willing to work hard in order to experience success in all areas of their lives. * The program is open to 10 women from Austin and 5 women from out of town. There will be 2 scholarship opportunities. * Austin participants: $100/month for 9 months = $900. Pay in full by March 1 = $700 ($200 savings). * Out of town participants: $75/month = $675. Pay in full by March 1 = $550 ($125 savings). In 9 months you will be physically and mentally stronger. You will know how to set goals and how to achieve them. You will have a clear picture of where you will be in 10 years and how you're going to get there--including how to overcome the road bumps that try to stop you. **specifics will be given when you sign up. Payment options: cash, check, PayPal. Trigger Point? What’s the Point? Lets talk seriously about why you would roll around on the floor with some funny looking rollers and a ball and a block and make bitter beer faces. And why would you spend $135 dollars on a kit that you would take home to your husband and be excited to get him on the ground with it? Because it has healing powers that's why! Some of you are CrossFitting as well as living your lives to the fullest! Some of you are also walking around a little “out of balance.” By balance I mean tight because you are toned, but supple because your muscles are pliable and capable of full work capacity. Trigger Point Therapy was created by a man by the name of Cassidy Phillips right here in Austin, Texas. I have had the pleasure to train and study under him for several years. I know that my training would not be where it is with out TP. I use it in my personal routine everyday. Whether it is before or after a workout or 30 min before bed to get some relief from muscle tension, I am glad to have my Trigger Point kit on me at all times! I am offering an opportunity to learn how to trigger point yourself on Tuesday, February 16th at 6pm. You must RSVP to this blog. I am only able to take 10 of you and if you have a kit please bring it! Take care of the only body you will have in this life. Eat good food & drink lots of water! Anderson High Womens only Boot Camp! I have the pleasure to spend some time with some amazing women every Tuesday and Wednesday. 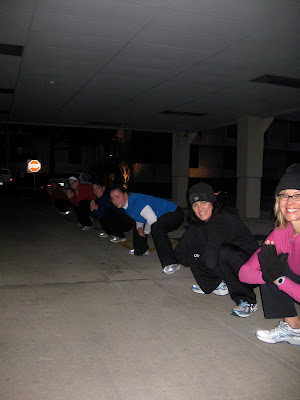 We get up early to meet each other and do some Boot Camp CrossFit style workouts. It is tons of fun and the accountability is amazing. I have about 5 more spots and hot deals for those of you who have a friend that wants get tight before those clothes start coming off! You know bathing suit season always sneeks up on you! Eating the tail first is the best!!! Maybe you should! These little suckers have a lot of punch! I am so happy to have a can of Sardines in my lunch box! Did you know that "ounce for ounce, sardines provide more calcium and phosphorus than milk, more protein than steak, more potassium than bananas, and more iron than cooked spinach." Big Mike asked me what my secret was...I just leaked one!